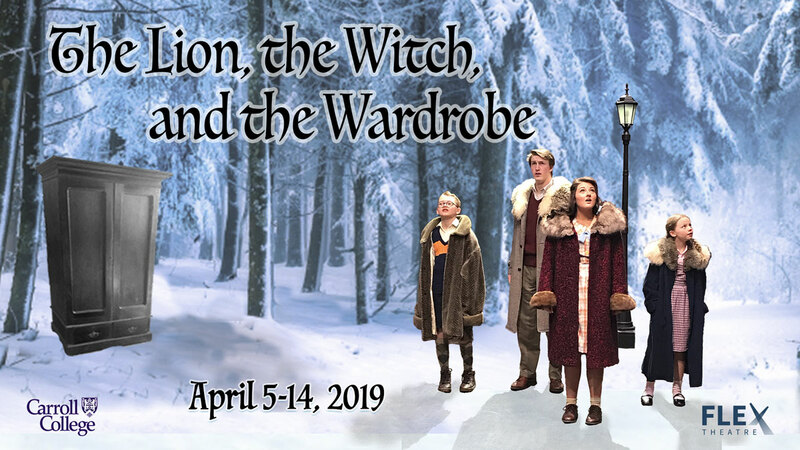 HELENA – Carroll College Theatre is producing the play The Lion, the Witch and the Wardrobe dramatized by Joseph Robinette from the story by C.S. Lewis. This show will run April 5 – April 14, in the FLEX Theatre in the lower level of the Carroll College Campus Center. Carroll College’s children’s play is C.S. Lewis’s classic story dramatized. The play takes place in Narnia, where four children must help restore the land’s rightful ruler and abolish the tyranny of the White Witch. Shows will be at 7:30 p.m. on April 5, 6, 12, and 13 and matinees on April 7 and 14 at 2:30 p.m. Parking is free in the Campus Center lot off of Lyndale for all performances. The theatre is fully ADA accessible through the east entrance of the Campus Center. Tickets are available at the door or online. Tickets are $15 for general admission, $10 for students and seniors, $5 for children 12 and younger, and $5 with a current Carroll College ID.